The IBM® TS3310 tape library is a modular, scalable tape library designed for businesses challenged with rapidly growing data backup and long-term data retention needs, and limited physical space for a tape library. The TS3310 offers simple, rapid expansion as processing needs grow. Built around a 5U-high modular base library unit, the TS3310 can scale vertically with expansion for LTO Ultrium cartridges, drives and redundant power supplies. Over time, as your need for tape backup expands, you can add additional 9U expansion modules, each of which contains space for additional cartridges, tape drives and a redundant power supply. Provides a modular, scalable tape library designed to grow with your needs. Features desktop, desk-side and rack-mount configurations. Delivers optimal data storage efficiency with high cartridge density, using standard or write-once-read-many (WORM) Linear Tape-Open (LTO) Ultrium cartridges. 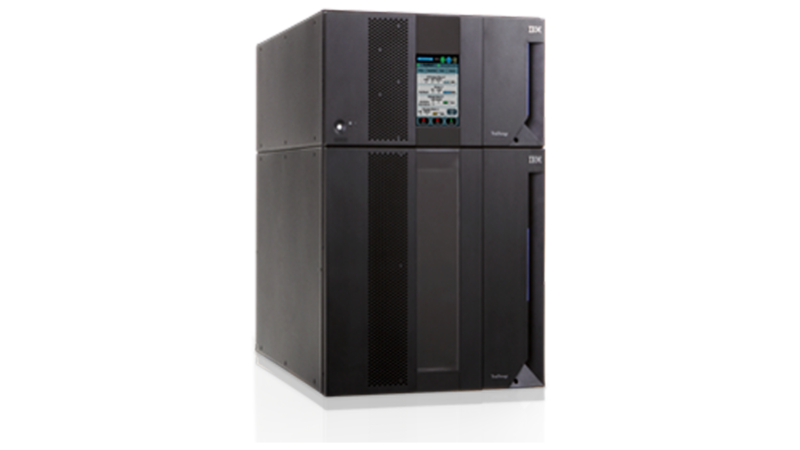 Features IBM Spectrum Archive™ with IBM Linear Tape File System™ technology for efficient user access to data stored on LTO Ultrium 8, 7, 6 and 5 cartridges.